"A delicious pork-filled potsticker recipe which has 2 ways it can be made and a delightful sauce to go with it! These are great as either an appetizer or a main course." Place green onions on a flat work surface. Slice whites and about 1 inch of the green parts thinly. Reserve 1 tablespoon sliced green onions for the sauce. Combine pork, egg yolk, green onion, garlic, cilantro, and salt in a bowl. Mix filling thoroughly by hand. Separate and place wonton wrappers onto your work surface. Spoon about 1 teaspoon of the filling onto the center of each wrapper. Use your finger or a pastry brush to lightly moisten edges of wonton wrappers with water. Fold one corner of the wrapper over the filling onto the opposite corner to form a triangle. Press edges together to seal the potsticker, removing any air pockets. Bring a large pot of water to a boil. Add a few potstickers; cook until they float to the top, about 2 minutes. Remove potstickers with a slotted spoon and place on baking sheet or plate to dry. Repeat with remaining potstickers. Mix soy sauce, sesame oil, and rice vinegar together in a small bowl with a fork to make sauce. Add the reserved green onions. Serve sauce alongside the potstickers. For the alternate way to make this recipe, heat a 12-inch skillet over medium heat. Brush with vegetable oil. 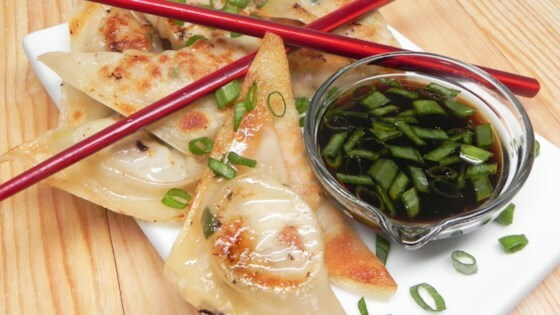 Add 8 to 10 potstickers at a time to the pan; cook for 2 minutes, without touching. Pour in 1/3 cup chicken stock to the pan, reduce heat to low, cover, and cook for 2 minutes more. Remove wontons to a heatproof platter and place in a warm oven. Clean the pan in between batches by pouring in water and allowing the pan to deglaze. Repeat until all potstickers are cooked. You can substitute the pork with finely chopped and sauteed carrots and cabbage. Very good! And fun to make! The sauce needed about a tablespoon more of soy sauce than what the recipe says, but overall they were delicious.